DarkWave Studio is a modular virtual studio, similar to the tracker / modular studio Buzz. DarkWave Studio allows you to load various machines such as virtual instruments and effects and connect them in a modular and straightforward fashion. DarkWave Studio can load VST instruments and effects and it can also load machines using the DarkPlug API, which was custom made for DarkWave Studio. Modular Virtual Studio for Windows for the creation of electronic music. ...... 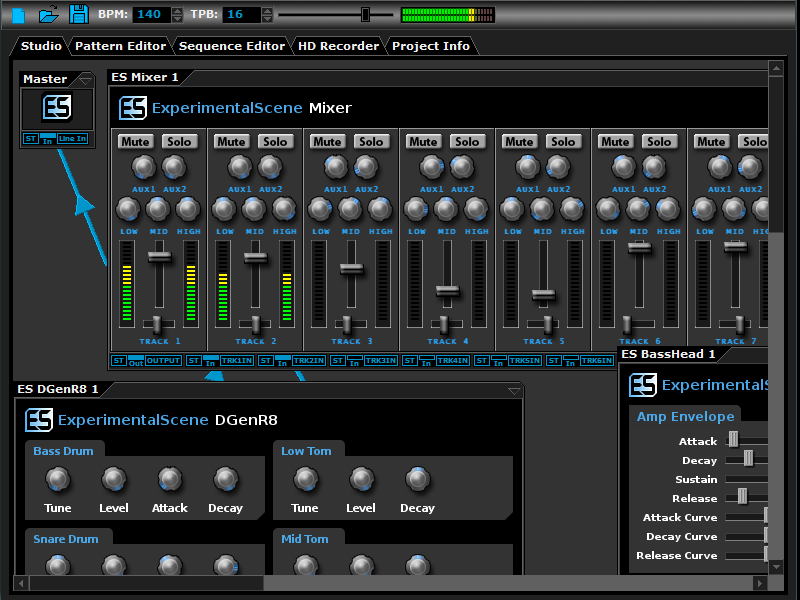 The sequence editor allows you to queue patterns to play for each control track in any arrangement, enabling reuse of patterns and quickly remixing projects. The Multitrack Hard Disk Recorder allows you to record the output of any machine and record it to 16-bit Integer of 32-bit Floating Point PCM encoded .WAV files for full-quality post-production editing or for conversion to MP3/FLAC/etc. Native x64 and x86 Windows Platform Support. VST PlugIn Support - Limitlessly Expandable With Instrument and Effects PlugIns. Multi Core / Multi CPU Support. Full 64-bit Double Precision Floating Point Audio Processing. Low Latency ASIO Audio Output. ES Arpeggiator - For Easily Playing Complicated Arpeggios With A MIDI Keyboard. ES ControlChange Mapper - Map Control Change Events From One Index To Another. ES MIDI Input - Play Instruments From A Music Keyboard. NCStudio ILDE is a server based Java IDE. Needs installation only on the server. Qweas is providing links to DarkWave Studio 3.9.1 as a courtesy, and makes no representations regarding DarkWave Studio or any other applications or any information related thereto. Any questions, complaints or claims regarding this application DarkWave Studio 3.9.1 must be directed to the appropriate software vendor. You may click the publisher link of DarkWave Studio on the top of this page to get more details about the vendor.